The world of 4K television and content technology is loaded with acronyms and other types of jargon, possibly sometimes to the point where they all just seem to mix together into something of a confusing mess. This applies all the more so when a couple of acronyms end up sounding very similar and occupying the same pretty specific context. Right now, we can hardly think of a better example of this than the OLED technology of LG’s 4K TVs and Samsung’s new QLED televisions which were so heavily touted at CES 2017 in January. Now while OLED has been around for years and since 2014 in 4K TVs specifically (long enough to be fairly familiar to most readers of this site), QLED is a completely new term that almost nobody outside the product development offices at Samsung probably knew anything about until recently. While we don’t think it’s entirely a coincidence that Samsung gave its new flagship 4K HDR TVs for 2017 a name that sounds so similar to the “OLED” found in the best 4K TV displays ever built to-date, the two acronyms refer to entirely distinct technologies and it’s important that you understand their differences if you’re thinking of buying either kind of TV. To put it simply, while OLED refers to the highly unique Organic Light Emitting Diode display technology that has made LG’s TV with this mechanism such uniquely awesome performers since they emerged. QLED is Samsung’s own distinct name for a beefed up version of the same LED/LCD TV display that their TVs have had for years. It has nothing to do with OLED technology at all, though it does deliver one meanly awesome twist on LED TV display. Before we go further, I’d strongly suggest you read our detailed guide on the general differences between OLED and LED/LCD TV display to understand exactly how each works and how they’re so different (and also why OLED is mostly much better in so many ways). Now, back to today’s OLEDs and QLED TVs, this is how they differentiate and ultimately stack up against each other. OLED, as mentioned above, stands for Organic Light Emitting Diode. In basic terms, this is a technology by which tiny carbon diodes (thus the “organic” part) are placed literally inside each individual pixel to emit light when an electrical current is applied to them. This is how OLED TVs light up for onscreen content and it also means that every single pixel can be lit independently while the pixels around it stay perfectly dark. The result is perfect, total, pixel-level local dimming and illumination on the TV display with all non-lit areas showing complete darkness. Another benefit of OLED technology is a much faster response time due to the thinner, simpler screen design and fewer layers of hardware. As a result, OLED TVs can react to color and lighting changes on the screen hundreds of times faster than most LED/LCD TVs. On the other hand, OLED simply doesn’t match the best of LED/LCD, or QLED for that matter on peak brightness. Even LG’s 2017 OLED TVs only promise 25% better brightness than the 2016 models and the brightest 2016 OLED TV we reviewed was the B6 model. This particular model was, oddly, LG’s cheapest 2016 OLED but could manage 740 nits or so. This means that the 2017 OLEDs will possibly hit around 1000 nits. For OLED technology this is impressive as hell, and especially so when those perfect black levels and infinite contrast are factored in but as we’ll see in a moment, even with this brightness level, this is where OLED pales (literally) next to QLED. In most of Samsung’s QLED TV models, the LED backlight array will be found only along the edges, with only the top models expected to have full LED backlighting behind the LCD panel, just as was the case with premium 2016 Samsung SUHD TVs. However, whichever is the case, the LED backlighting means that that the black levels of these TVs will be more or less like those of other premium LCD/LED TVs, and the local dimming will be by zones, instead of at the single pixel level as is the case with OLED TVs. In other words, at least as far as their backlight structure goes, QLED TVs use the same fundamental design of all previous LCD/LED TVs. What the Samsung QLED models do however offer to possibly outdo the best of previous LCD/LED TVs and even OLED display on color is the technology that gives QLED its name. Quantum Dot Light Emitting Diode is what it stands for and it’s a new version of LED in which quantum dot color enhancement material is built right into the diodes themselves in a way that lets them display extremely rich, subtle color variations even at the extremely high levels of brightness that these TVs will also be capable of. And bright they are going to be indeed, shooting out a whopping 2000 nits of peak brightness according to Samsung. That’s over 500 more than the best we ever saw with any previous Samsung LCD TV to-date. And as we described above, this is also one area in which OLED possibly can’t compete. Most LCD/LED displays lose some of their color saturation when they display very bright highlights. With QLED, this problem disappears and as a result, the picture quality generated by the technology is much more in line with extreme picture realism. An additional benefit of QLED that springs from this will be the ability to maintain high picture quality and color even at extreme viewing angles, just as OLED displays also can. Previous high contrast VA panel LCD TVs like Samsung’s 2015 and 2016 SUHD models couldn’t pull off this useful trick. So there you have it, QLED is basically LED display on steroids and despite the similar name and hype, it’s not quite the OLED rival that it might seem at a glance. With actual testing of both 2016 OLED TVs and Samsung’s QLED TVs, we think we’ll see QLED display as something better than all previous versions of LED display but still delivering an overall level of picture quality that doesn’t quite match OLED on some crucial metrics. Both types of 2017 TV will deliver superb HDR displays and stunning wide color gamut but the pixel-perfect local dimming, perfect blacks and exquisite motion handling of OLED are likely to win out again. But just my 2 cents!!! You are mostly right Arnaud. I agree with this sentiment for most content watching, but I suspect that the manufacturers just love to show off the fact that their TV can actually go bright enough to imitate reality a bit. In practical terms, a 4K TV with a brightness peak of 6 or 700 to 1000 nits offers more than enough light for an absolutely awesome viewing experience if contrast, color performance and black levels are all robust. What really matters then is the absolute lowest (IRE) black levels a screen can go, particularly when using in a dark room. If QLED can get the black levels down low enough to actually Look black and not dark grey, THEN Qled’s can start really giving OLED’s a run for thier money in the black levels. There does seem to be something fishy around here. I came to the site for knowledge and information. Seems to be a lot of bias for LG’s OLED’s than true unbiased opinions. The TV that you are defending is the one that has the legitimate chance to burn in. It’s in the users manual. The peak brightness is localized. Nits don’t refer to hire bright the entire screen is. Any idea as to what the price range is for the Samsung QLEDS? It also appears that 3D is being discontinued by many, focusing mainly on HDR and DV. Hello Kevin, that’s correct. All of the major brands have now apparently given up on 3D technology. Sony, Samsung and LG for sure. They’ve publicly stated as much. Sony basically said that 3D is “dead”. As for prices. 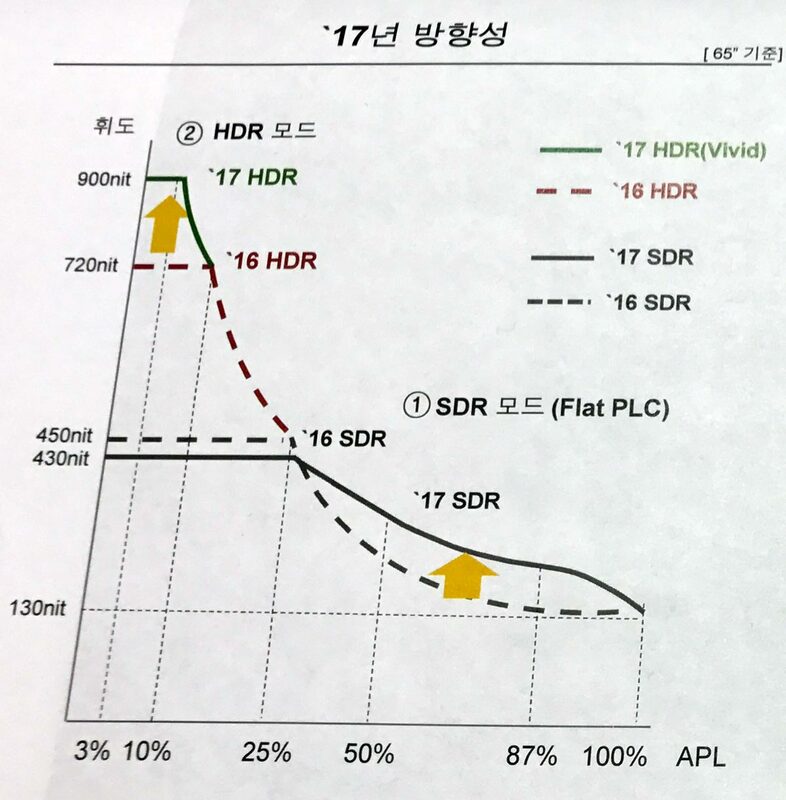 We can’t say for sure yet but i’d expect to see the QLED models retail for at least $300 or 400 more than their 2016 SUHD counterparts in the same size ranges. Thus, the Q7, Q8 and Q9 roughly correspond to the KS8000, KS9000 and KS9500/KS9800 TVs, with prices correspondingly higher. I am making an educated guess here though. I believe that Samsung only offered full array lighting on their flagship 2016 model (the KS9800). Is this likely to be the case again in 2017, or do you expect the 2017s to include full array on other high end offerings (say, the 2017 equivalents to the KS9500 and the KS9000)? Hey there Derek, so far, all of Samsung’s 2017 QLED TVs (the Q7, Q8 and Q9) will come with edge-lit backlight arrays. This won’t stop them from being extraordinarily bright but it will probably mean weaker local dimming. I don’t get why Samsung still persists with edge-lit even on most of its premium TVs. What we suspect is that a full-array model will come along a bit later in the year, as was the case with the KS9800. Thank you for the insight. If input lag across brands on 2017 model TVs is similar to what it was for 2016 models, I might be faced with a trade-off between low input lag and local dimming. Vizio had both last year, but their TVs were otherwise inferior to Samsung’s in most other ways. LG OLED would be great if they weren’t exorbitantly priced for the size that I’m interested in (75″ – 80″). Sony had unacceptably high input lag with 2016 models (which is kind of funny, since they sell Playstations). So, I’m planning for a late-2017 buy of 4k, as an upgrade over my Sony flagship of 2013 (FULL-HD). My max budget would be about $1,800-2,000 and based on the calculations on the viewing distance set up, I should be aiming for a 65” model. The problem is that with that kind of money I could aim for either a discounted LG B7 OLED with 55”, or a 65′ premium 4k. So where should I go, OLED with a smaller screen size, or LED with a bigger size screen? Hey there Nikos. We haven’t yet hd a chance to do serious reviews of th 2017 TVs so we might yet be surprised by some differences on quality between them. However, the 2017 OLED models are looking absolutely stunning so far. They offer the best OLED brightness we’ve yet seen and while the Sony and Samsung premium TVs for this year beat them on brightness, (and Samsung’s QLED TVs also offer almost OLED-like viewing angles, remarkably enough), we still think the OLED TVs outperform them across the board. Nothing yet beats those perfect blacks and single pixel local dimming/brightness control. That said, the premium LCD models are stunning by any normal measurement, so if you really want the extra inches, you’ll be happy with one of them too. Don’t the OLED TVs tend to have more lag than the QLED TVs? On the other hand, I read somewhere that OLED doesn’t have motion blur like QLED/LCD TVs so that is even more confusing!!! Hey there Eric. What might be causing the confusion for you here is the issue of input lag vs. response time. OLED TVs and especially the newer models deliver exceptionally high response times and their general tendency is toward virtually no motion blur as a result. However, their input lag can be high depending on how they’re calibrated, what sort of content you’re viewing and which model you’re using. We haven’t yet reviewed the QLED TVs so we can’t vouch for either their input lag or motion blur but given what we saw with the 2016 SUHD TVs, we’re expecting the 2017 QLEDs to be exceptionally high quality TVs in how little motion blur they produce. Samsung is also particularly known for very low input lag in their TVs, especially for gaming. LG’s 2016 OLED TVs had issues with input lag during HDR gaming but the company took steps to fix this issue and we’re expecting the 2017 OLEDs to offer better lag performance for console games and so forth. To clarify further here. Input lag is the speed at which a 4K TV reacts to off-screen inputs like console controllers other controls while repsonse time is the speed at which a TV’s display panel changes colors inside its pixels. The faster it does this, the less motion blur the TV displays. Unless you watch your tv with bright lights turned on in the house then a excessively bright tv is not needed, what you need is deep black levels and that is where oled shines so oled is still the king of the pack.